The Seahawks soughtyto retain DT Sheldon Richardson, but the unrestricted free agent opted to sign with Minnesota for a one-year deal potentially worth $11 million. 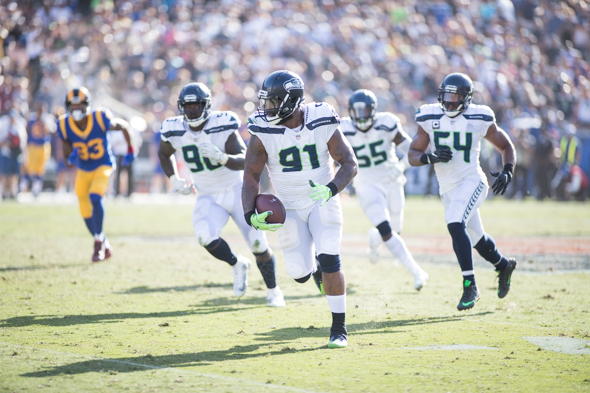 The Seahawks Friday lost the one unrestricted free agent they most wanted to keep when DT Sheldon Richardson, who played one season in Seattle after his trade acquisition from the New York Jets, bolted for the Minnesota Vikings. But he signed only a one-year contract potentially worth $11 million. Richardson’s base, according to the NFL Network, is $8 million, the rest in incentives. The Vikings landed Richardson one day after signing the most coveted free agent of 2018, QB Kirk Cousins, formerly of the Washington Redskins, for a reported $84 million, all guaranteed. Richardson publicly expressed a desire to remain in Seattle, but that didn’t pan out. Richardson in 2017 racked up 36 total quarterback pressures and 22 run stops, which ranked ninth and 17th among defensive tackles, respectively. He also had a fumble recovery and an interception. In Minnesota, Richardson is slated to replace veteran DT Tom Johnson alongside run-stuffer Linval Joseph and the edge-rushing duo of Everson Griffen and Danielle Hunter. The Vikings are poised to rival Philadelphia’s as the league’s most disruptive defense. Due to salary cap constraints, aging players and injuries, Seattle’s recently historic defense has been shredded. Prior to losing Richardson, the Seahawks traded away Pro Bowl player DE Michael Bennett and released into free agency Richard Sherman. The careers of SS Kam Chancellor and DE Cliff Avril are in doubt due to series neck injuries, and All-Pro FS Earl Thomas appears to be on the trading block. Seattle also lost two major offensive contributors from 2017, TE Jimmy Graham, who signed with Green Bay, and WR Paul Richardson, who inked with Washington for $40 million over five years. The Seahawks Friday signed Ed Dickson, an unrestricted free agent from Carolina, to replace Graham. The Hawks were offering him $11 mil, also. Obviously good free agents don’t like Seattle as an attractive destination any longer. Rebuild years should expect that, you cannot dump such well known names from a team and expect it to not affect the perception around the league. A one year prove it contract was never going to help the Seahawks here anyhow, we needed him to sign a reasonable multi-year contract or nothing. But is this rebuilding? Some folks say it’s not. The Malik McDowell draft pick just got even worse. I hope this is a rebuild, if not it means we are making transactions that are making us worse in the short term but the Seahawks think they will make us better this year. I prefer to think that they are making the transactions with 2-5 years out in mind. No way the person stepping in for all the recent pro bowl players we jettisoned for almost nothing are seen as better players at this moment even though they saw almost no play time. It would be the best kept secret in football ever. If rebuild, then go all in for it, not half-hearted. Trade Russell and Earl now for draft picks or young studs. Fair enough, I think we differ on terminology, what your suggesting is what I would call “blowing it up” because you leave nothing of the core players to “rebuild” around. I prefer rebuilds because I think it is important to have a respected Vet on each side of the ball to set the tone in the locker room. We have R.Wilson and B.Wagner. Also getting rid of a franchise quarterback extends the likely time to return to Superbowl contention by at least 3 to 10 years, they take time to find and develop. I think the Hawks can be a contender within the next 3 years if they play their resources right. I agree 100% with your take on the past prime signings. Schneider says re-tooling, not rebuilding. I have heard in sports the terms retool, rebuild, and reload all used in the same manner. While their use should be different, retool means to change the function of something existing where as rebuild means to take down and replace, and reload means to fill existing gaps. None of them are meant to be absolute. The message the GM’s and Coaches are desperately trying to convey is that they aren’t starting over, even if they are, so don’t stop spending money on them. Its there for free agents as much as consumers. Remember a couple years ago when the 49’ers said they were just reloading and went from the top of the league to the bottom? This was expected when we didn’t sign him before free agency. We were never going to be the highest offer once that happened. Same is likely for Suh. Honestly, this is good for the Hawks, big money contracts to DT’s has not worked out across the league. Very high impact position but not worth QB or even CB money considering half of their job, run stopping, is easy to get across the league so all your really paying for is pass rush from the DT position instead of the DE or OLB position. A nice luxury to be sure but not worth the current price. The worse part of this signing is the draft picks that we essentially smoked to get a 1 year rental. I’d think the Hawks offered a three year deal. I wonder what made the Vikings more appealing? The true death knell for the Hawks – when a fine player signs with another team and says “I thought Minnesota has a better chance at a championship”. It’s over for the Hawks, and I put a LOT of blame on Schneider. Allen must ask “What have you done for me lately?” Schneider has blown the chance to have establish a dynasty and needs to be replaced. According to the NFL Network, the Seahawks are signing Tom Johnson to a one-year deal worth up to $2.7 million. Tom Johnson was the Viking who lost his job due to Sheldon Richardson’s signing.